Just as the name suggests, the game is set in a beach background where your main aim is to set up a base on the beach. This kingdom building multiplayer game was launched back in 2014 and is compatible with iOS and Android devices. It involves clashes with other online players as well as with the system itself. You can create your own structure to set up your beach base and you can also look for useful resources from other players bases to gain more strength. It is one of the best games like Clash of Clans that you can opt for as its alternative. This thrilling tower defense game is available for Windows, Android, and iOS systems. In this game, you get to choose your own civilization, combat and defend your own tower against other players. The game allows you to send two heroes to combat for your defense and you will get a maximum of six minutes to break down other’s towers and defenses. Available on Android, iPhone, and iPad, the Battle Dragons will become your favorite if you are a fan of mystical dragons. In this game, you have to command your dragons and with their help you get to destroy your rival’s villages. There are ten different types of dragons and you also have to build your dragon fortress to defend your village. People have got very good reviews for this game. One of the most popular games similar to Clash of Clans, Call of Duty has sold over 250 million copies worldwide and has made a whopping 15 billion US dollars business. The game works on a wide range of platforms like Android, iOS, Xbox, PS etc. It has won several awards in the video games category. Your job is to upgrade your outpost, level up your heroes and defend your outpost. With drone strikes, survival modes, PvP, campaign mode, the game has quite a lot to offer. Star Wars fan? Then you are gonna fall in love with this amazing action and strategy based game. There are two side, the dark and the light side. You can choose either of them and then fight against the other side with the help of your troop. You can upgrade your troop and heroes and then lead your troop to victory. It works on multiple platforms like Android, iPhone, iPad and Windows. It is one of the best games like Clash of Clans that flaunts over 50 million installs. It is a very well-planned game and you are going to love it even more than other games like Clash of Clans. You might find a game named Clash of Clans: Age of Legends in the Playstore…it is this game that has now been renamed as Castle Clash: Brave Squads. You can build your own forces, upgrade them and defend your village against other forces. It is a strategy based cross-platform game like Clash of Clans. Here, you have to create your military base and then defend your fortress with your army troop. The backdrop in set in a jungle where you need to fight off your enemy troops. You can also loot your enemy’s resources to strengthen up your troops. Fight off players playing online across various platforms like Android, Windows, and iOS. You might be able to recall a game named Stick…a man made out of sticks running on an open ground? Well, this game is just the Clash of Clans version of the stickman. Here too you have to build up your army and have to fight against other armies. With varieties of action involved, even though the game lacks depth, it will still steal your heart. Like goofy and fun games? Stick War: Legacy is the one for you! You can enjoy this Clash of Clans like game on any Android and iOS device. In this multiplayer game, the player has to create his own clans and try to capture the place of power located in the middle of the kingdom. You can also upgrade your skills and resources in the game and thus gain a more powerful clan for the combat. Unlike other games listed here, this one supports hundreds of online players at a particular time. Yet another massively multiplayer online game is the Clash of Kings. Released just three years ago, over 65 million downloads speak a lot about its popularity all over the globe. The game has been endorsed by several celebs across US, Korea and Japan. With eye-catching graphics and thrilling plots, it is one of the finest games released till date. The game is available on iOS and Android devices and has also received quite amazing reviews from various gaming critics. Though there are many more games like Clash of Clans available, we have listed some of the best and most popular ones here. If you want us to add anything to the list, do not hesitate to give your suggestions in the comment section below! 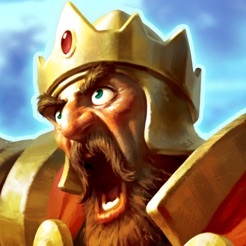 I love the Castle Clash. But I must admit, that you have a little broken website, it shows an error in the beggining of the post.